Ummm, hello, it’s already November? I swear each year goes by faster than the last. It seems like just yesterday I wrote this post on family pictures for my Christmas cards last year, and now here I am again. This year is special because we have a new addition to our family, which also means making three kids look at the camera simultaneously (wish me luck). In the end, it’s all worth it when my mailbox fills with printed cards from our friends and family. Nothing, and I mean nothing, puts me more in the holiday spirit. Okay, except for maybe a gingerbread latte from Starbucks. That runs a close second. Every year, I have that one friend who not only has the perfect family picture but also took the time to cleverly plan it. (You know which friend you are.) So I swear, this year, I’m going to start early and plan my perfect Christmas picture. Maybe I’ll even steal a little inspiration from these talented (and super cute) families! This adorable family used letters as props. They could print the picture as is for the perfect card! I love the idea of showing everyone’s personality in the cards. How fun would a photobooth style card be? Sometimes lighting is everything in a photograph. What a cool way to involve the kiddos and get great lighting! I love the originality of this image! The possibilities are endless, but if you don’t have an entire wall of chalkboard hanging around, just grab a few handheld ones. How cute would it be for each kiddo to write something personal—like what they asked Santa for or what they are thankful for? You can check out my Pinterest board for even more fabulous finds and ideas for your family pictures this year. Funny.. I was just asking my husband for a creative family Christmas photo idea… And I see this! Absolutely love these photo shoot ideas! My fave is the photo booth one. Cool. Our family portraits for our Christmas cards for the past years have always been formal. All of us sitting by our tree, mostly. So maybe this time you can do it differently and go wacky! This would surely surprise everyone who gets your card! So maybe this time around you can do it differently and go wacky! This would surely surprise everyone who gets your card! 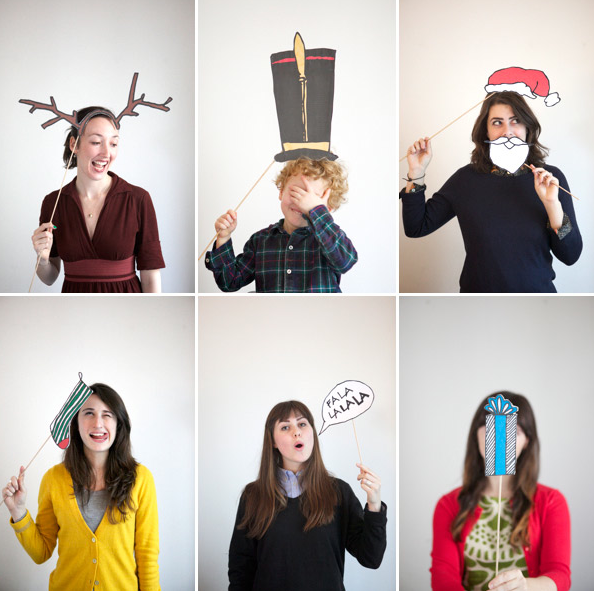 Good selection of holiday family photo ideas!